This stunning Florida home is situated in the heart of the South Florida Gold Coast just five minutes from the beach, close to several major malls & a limitless choice of great restaurants. Located in one of the most desirable parts of Fort Lauderdale in a quiet neighborhood, the home is still close to all the action. The living room, dining room, kitchen & master bedroom all open to a lush, tropically landscaped deck & heated pool. Just beyond the pool deck and privacy landscaping, you will step on to a ninety foot dock concrete dock that is available for your own boat or a rental, if you choose. From the covered deck you can access are several areas of the home including the kitchen, living room, master bedroom, a full bathroom with shower and also features an outdoor dining area featuring a large Weber gas grill. Enjoy that important sporting event on an 80 inch HDTV located in the living room but swivels to a position outside on the deck. A child pool fence is also available if desired. This property is really the ideal setting for family fun in the Florida sun.The living/family room has a HDTV, DVD & WIFI. The living room features automatic cozy and comfortable powered reclining sofas. The master bedroom, which also opens to the pool deck, has a king bed & 50inch flat screen HDTV and boasts a large walk in closet and large ensuite bathroom with granite counter tops and shower. The roomy second bedroom has a queen size with a 32inch flat screen HDTV bed and large closet. The third bedroom has two double beds with a 32inch flat screen HDTV a closet. The kitchen, which overlooks and opens to the pool, features all stainless appliances, and dinette with a large dining table. The second bath has a tub/ shower combination and features a granite counter top. The third bathroom which is accessible from the pool deck and from inside the home features a granite counter top and a full shower. Plenty of parking is available on the circular driveway and in front of the double car garage. Have a cool drink on the pool deck a night while enjoying the pool deck featuring expansive mood lighting that illuminates the tropical gardens, the pool and beautiful dock. You are truly in the best of both worlds with the ocean & beaches only minutes away while enjoying the comfort of a beautiful, pristine home in a safe, quiet, family neighborhood. Area residents can be seen jogging, walking or riding bicycles at all hours of the day & evening. Also dozens of great golf courses are within a 30 minute drive with several only fifteen minutes away. This meticulously kept property is the best situated and best value in the area on absolutely one of the streets that is a cul de sac. Make this your choice for a wonderful vacation full of fun and relaxation in beautiful South Florida, the Venice of America. After welcoming a beautiful vacation home into our family, sadly we do not get to use it as often as we like and are happy to share this little piece of paradise with others. Spacious, pool and waterfront home located in the BEST part of The Landings which is on the east side of Bayview. 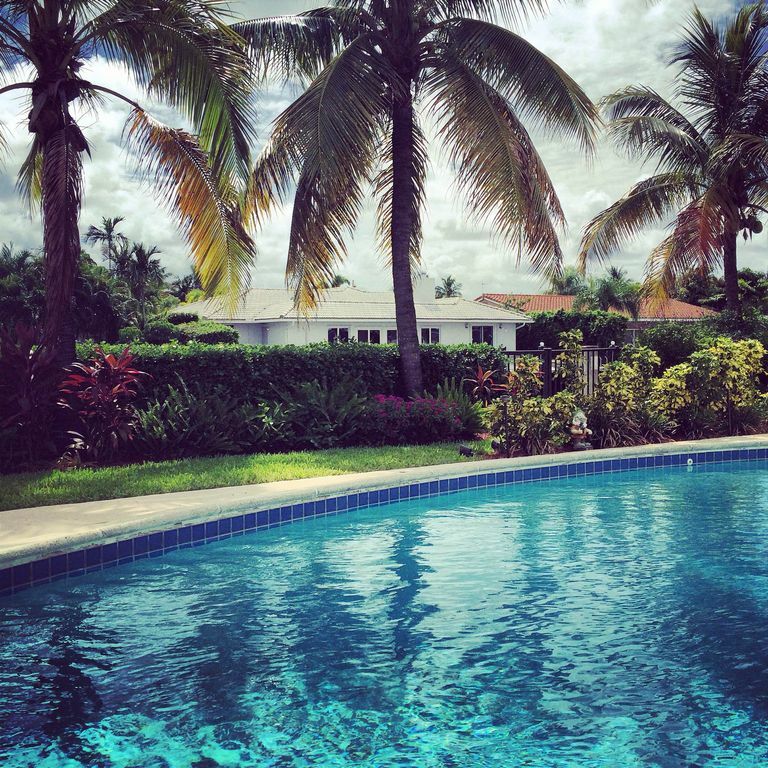 Pool is immaculate and you're less than a 5 minute drive or 20 minute walk to the beach! Located close to the end of a private cul-de-sac in the prestigious Landings area, our home is a Waterfront property in the best location possible in this area, as our dock can accommodate any size boat. All of the furniture is brand new, including beds, pillows, linens, automatic reclining sofas, brand new kitchen appliances, newly renovated bathrooms, immaculately kept and 2amazing crystal blue pool with loungers and covered patio table. Enjoy privacy with only a 5 minute drive or 22 minute walk to the beach with fishing pier. Enjoy a spacious master ensuite featuring dual sinks with granite counter tops and a large shower. All other bathrooms spacious and exceptionally clean. Waterfront, deep water, wide canal, ocean access, 90ft dock available to accommodate any size boats, and sailboats, main intracoastal 2 minutes away. Large stainless steel whirlpool refrigerator. Ice maker included in freezer. Patio outside accommodates 6, can accommodate up to 10 people. Folding table and extra chair available. 90 Foot dock can accommodate any size boat or sail boat as the property is located in an area that does not have any bridges and does not restrict the height of boats. The property is lovely. We enjoyed the home's floor plan and beautiful pool and grounds. This lovely home suited our family very nicely. We enjoyed swimming in the heated pool, soaking up the sunshine, and boating. While visiting, we rented a boat that we could tie up at the property's pier. The house itself was nicely appointed. We enjoyed our visit tremendously; and we recommend this vacation rental highly. We made a last minute decision to take a spring break vacation and Mara was great to work with under short notice. She was very responsive and made sure we had everything we needed and that we had a great time. The house is very nice and the neighborhood is very quiet yet with a couple minutes drive you have great restaurants and the ocean! Great house and if we decide to come back to the area will definitely stay here. I would highly recommend this home! The owners were so nice and accommodating. The house and it's amenities are terrific. My family and I hope to go back. Our family, six adults in different ages and three children, 7,9 and 2 years old stayed in this house for one week and we didn't want to leave it. We all liked it very much. Very spacious, clean and well-maintained. The pool was super.Lovely calm surroundings near the beach and fine restaurants. We had a very good communication with Mara from the beginning and we would sure recommend this property to a friend. This property has so many positive comments, there is no need for me to reiterate them. If you want a quality property at a reasonable price, get this one and enjoy your stay. It was also reassuring to know that there was a local representative available. We just got back from Florida after spending a month in Mara and Bruno's home.The experience was just wonderful. It is a beautiful home and Mara really was all about our comfort. We will definitely go back again and refer all our friends to go there. Located in The Landings which is a gorgeous tree lined, well established, upscale waterfront community located in northeast Fort Lauderdale. Situated north of Commercial Boulevard, East of US1 and West of the Intracoastal waterway. This luxury, prestigious home is on the east side of Bayview Drive with Deep-water, Ocean access and able to accommodate any size boat. The 100 foot cement doc will allow any size boat (amp of 50 and amp of 30). This property is not located on a main road, but rather on a quiet cul de sac.